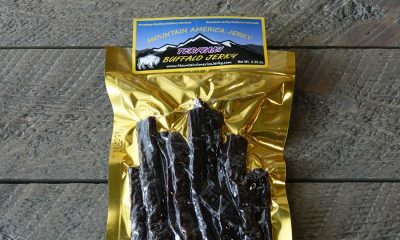 For a multifaceted flavor, Teriyaki Elk Jerky is a sweet, mild black pepper taste treat. The deliciously mild flavor enhances the natural flavor of the elk, bringing an Asian twist to a Rocky Mountain favorite. 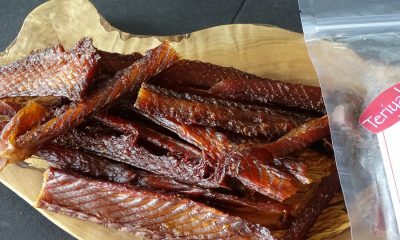 This is a traditional style of jerky using whole strips of meat, the way jerky should be. 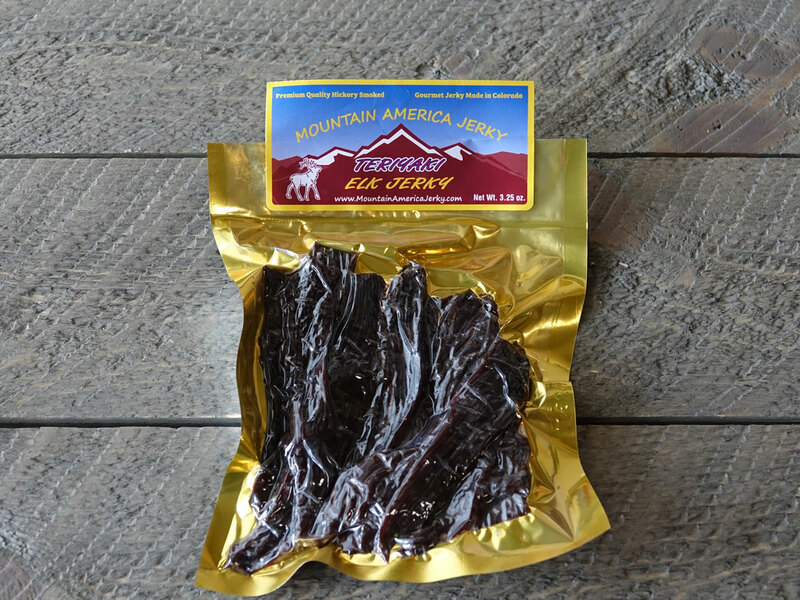 Our Teriyaki Elk Jerky uses whole pieces of muscle meat from premium farm raised Elk that is never treated with growth hormones or steroids. It is thick cut, marinated, and hickory smoked daily. It is smoked with no MSG, nitrates, or other fillers. 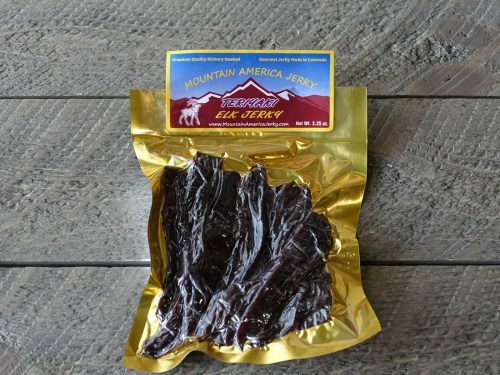 Buy our Teriyaki Elk Jerky today and discover the perfect gift for the jerky lover in your life (who just might happen to be you). Was a Christmas present for a hunter friend. He thoroughly enjoyed. 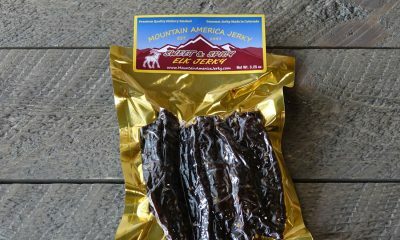 (Teriyaki Elk review) The jerky tasted very good. I just placed my third order and plan on placing more in the future. (Teriyaki Elk review) I never pass up jerky any chance I get and unfortunately I hadn’t had the pleasure of trying your jerky until now! 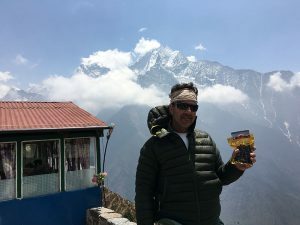 I received an exotic sampler package for my birthday from Ostrich, Elk, Yak, Antelope, Kangaroo, to even Alligator–and I can guarantee that this is the best jerky I have ever had!! I have yet to go through all of my sampler, but have tried your Elk, Alligator, and Ostrich; the Alligator blew my taste-buds clear to heaven! 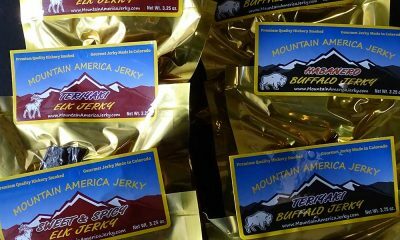 Thank you for creating such amazing, all-natural, hand-made jerky! You now have a loyal customer and will buy from you whenever I get the chance!